Self-control, concentration, following instructions and fine motor skills are very important foundational skills for all children. Teaching your young child to sit and focus on an activity and see it through until completion will go a long way towards preparing them for later learning – whether that be in the homeschool or traditional school environment. Some children seem to be naturally better able to do this, others need training and practise to do it. Children who do not develop these skills early will find it much harder to learn and you will find it more difficult to teach them! 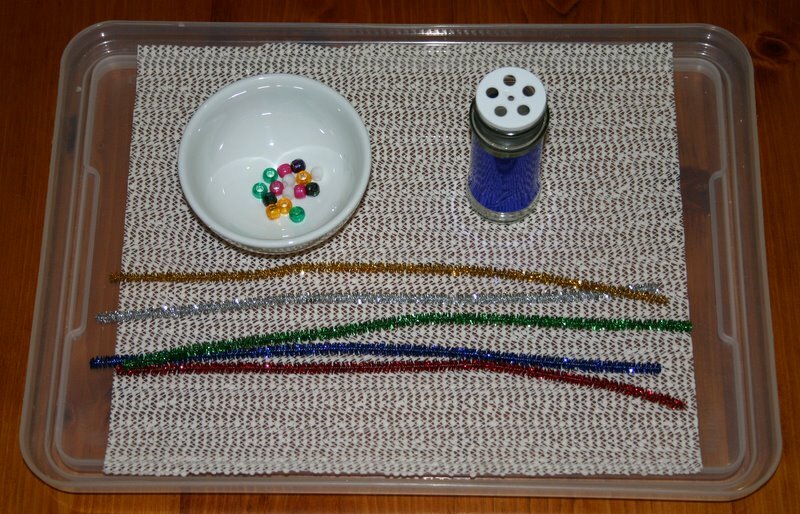 Here are several Montessori style tray activities for toddlers and preschoolers that will help to develop their fine motor skills. Many parents of young children say that their children will not sit still long enough to attempt, let alone complete an activity like these and that may be the case right now. It is however most certainly possible to train them in this skill so that sitting and focussing becomes something they readily cope with, both at home and when out. Start with very basic activities like the first couple below that do not take very long to do and are not too challenging to complete. Help the child to learn the process first: take the tray out, sit in the designated place, complete the activity in the same way you have demonstrated it, place everything in the same place on the tray as it was found before returning the tray to where it belongs. You may like to attempt only one tray to begin with so as to finish on a positive note. Praise your child for their attentiveness, perseverance etc. Five minutes for a toddler who is not used to this kind of task is a beginning. Work up from there until they can sit for an extended block of time. My twins at 2 1/2 years can sit for 20-30 minutes with activities that change every 5 to 10 minutes, depending on what it is. My other three children would have spent 30 to 45 minutes working on these at the same age and even up to an hour at times. The chopstick is placed into the neck of the spice jar and large beads threaded onto the end. It takes quite a bit of coordination to operate an eyedropper. Transferring liquid from one small container to another is a challenge for many toddlers. 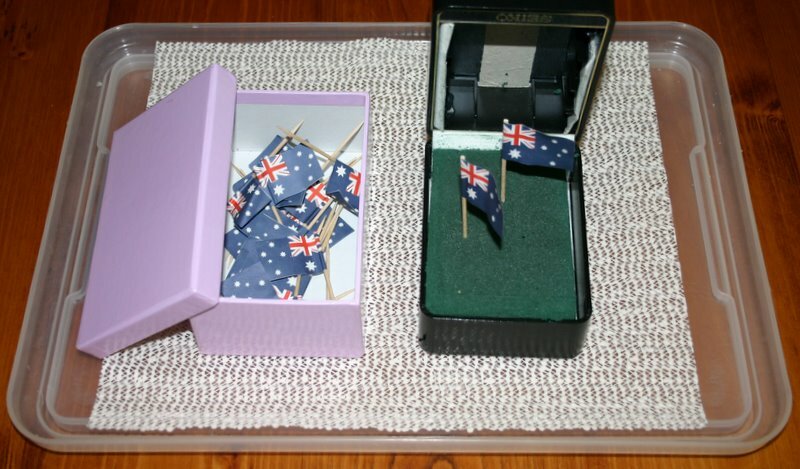 Perhaps use uncoloured water to begin with and provide a sponge for spills. Yes, they will probably taste the angel hair pasta as they feed it into the small holes in this spice bottle but it’s only pasta after all! This is a piece of polystyrene packaging with a loose weave hessian cover. You could include a set of numbers and have an older child set out the correct number of birthday candles. Another spice jar with toothpicks – don’t throw out those old spice shakers! Stretching hair elastics over a jar is surprisingly difficult for young children but they enjoy it anyway.